Some time ago, I posted an item about a Portsmouth Corporation trolleybus, one a several which were lent to Pontypridd during the war. Hull did so, too. Pontypridd UDC had a fleet of trolleybuses which, during the life of the system, (between 1930 and 1957) in total, amounted to just 17 in total, initially with 7 all-English Electric single-deckers. These were augmented by two double-decker demonstrators in 1930/31, eventually purchased in 1932, one being an all-Guy BTX. 1945 brought 4 Karrier W’s, bodywork shared equally between Weymann and Park Royal, and four more in 1946, two bodied by Weymann and two by Roe. The last eight formed the entire fleet from 1947 to the end 1957, bar the two with Roe bodies, which were withdrawn in 1955. The other 1932 demonstrator (above) was a very rare bird indeed, a Bristol E with Beadle bodywork, which lasted until 1946. In 1929, Bristol developed two six-wheeler chassis, the C and E types. Despite six-wheel chassis being popular at the time, only two of each type were ever built and, of these four, only the two E-type were ever bodied. One went to Doncaster Corporation, the other to Pontypridd UDC, both in trolleybuses form, the only trolleybus chassis Bristol ever built! Photograph and Copy contributed by Chris Hebbron with acknowledgement to Peter Gould’s Fleet List website. 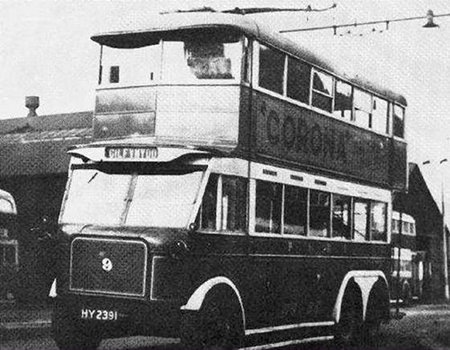 One of the two Bristol trolleybus chassis (E101) was fitted with a Roe body and delivered to the order of Doncaster Corporation (registered DT 2620). It ran on loan there from August 1930 until Feb 1932, when Doncaster purchased it as No 31. It had a BTH 60hp motor. 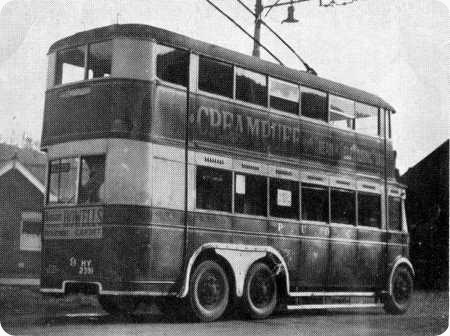 Doncaster apparently encouraged the development of the trolleybus version of Bristol’s 6-wheel motorbus. But they did not buy any more, continuing to purchase Karriers instead for successive pre-war deliveries. The other trolleybus chassis (E102) was constructed in 1930 by converting 3-axle motor bus chassis C101. This was fitted with a Beadle 60-seat body, and is the one shown as Pontypridd UDC No 9. It ran as a demonstrator at Pontypridd 1931-32, then purchased by them. It had a Bull motor. In spite of their rarity, both led full service lives (Doncaster to 1945, Pontypridd to 1946/7). Apparently one of each type (i.e. a 3-axle C-type motorbus and and a 3-axle E-type trolleybus) were exhibited in chassis form only at the 1929 Commercial Motor Show. This is from information in Geoff Lumb’s "British Trolleybuses 1911-1972", supplemented by "British Trolleybus Systems" (Joyce, King & Newman). It’s probable that Bristol wanted to concentrate more on the motorbus side, especially when the Tilling-based companies moved to support them strongly when they moved away from the Tilling Stevens marque in the early to mid-thirties. Thx for that useful additional information, Michael. The Doncaster one was even more non-standard with the Bull electric motor, a make I’ve never heard of! The wonder of rare vehicles is that a photo exists of them. For example, Portsmouth Corporation bought its sole AEC Regent before the war, which, typically, was destroyed, thanks to a certain A Hitler. I’ve never seen a photo of it. Chris, You may not have heard of Bull Motors but their factory at Ipswich survived until around 2000. Their products were often fitted to trolleybuses made by another Suffolk company, Garretts of Leiston, an example being one built for Copenhagen which has just been put in to service at the East Anglian Transport Museum at Carlton Colville after restoration. I had a vague memory that Doncaster’s first trolleybuses were Garrett double deck 3-axle vehicles, with Bull motors and Roe bodies similar to those supplied in the same year based on Karrier E6 chassis. When checking this in Geoff Lumb’s book I mentioned last time, it turns out that Bull Motors Ltd were a firm in the same group as Garrett, which was Agricultural and General Engineers Ltd. Garrett’s were based at Leiston, Suffolk, but I don’t know where Bull Motors were located. They supplied motors to most (if not all) Garrett trolleybuses. Garrett’s made trolleybuses from 1925 to 1930, when they decided to withdraw from that sector. This decision led to Bull’s supplying motors to both a Karrier-Clough demonstrator, and the Bristol for Pontypridd. Garrett’s decided to withdraw rather than modify their designs, as although the batch supplied to Doncaster had similar Roe bodies to the contemporary Karriers, there were differences underneath. The floor height of the Karriers was 2ft 1in, which was 9ins lower than the Garretts. I haven’t been able to trace Bull Motors equipment being supplied to any other manufacturers’ vehicles. Bull motors were fitted to some ADC chassis for Bradford, as well as Garrett and I believe this firm was owned by E.R. and F.Turner of Ipswich. A complete history of Pontypridd Trolleybuses was passed to Trolleybooks, the joint publications panel of the British Trolleybus Society and the National Trolleybus Association, two years ago. It should, hopefully, appear soon.